I gave a talk a few months back at Products that Count, hosted at Airbnb in San Francisco. My talk was about adapting your marketing strategy based on the maturity of the market. The talk was well received, but it was my description of “the helper play” that drew the most attention. I don’t know who initially conceived the helper play, but I came to know if from a successful company in the cybersecurity market, Palo Alto Networks. The startup wanted in on the large firewall market. But in 2004, when they were founded, the 800-pound gorilla in the space was Check Point Software Technologies, which at that point had been in business for over ten years and had revenues of $515 million. 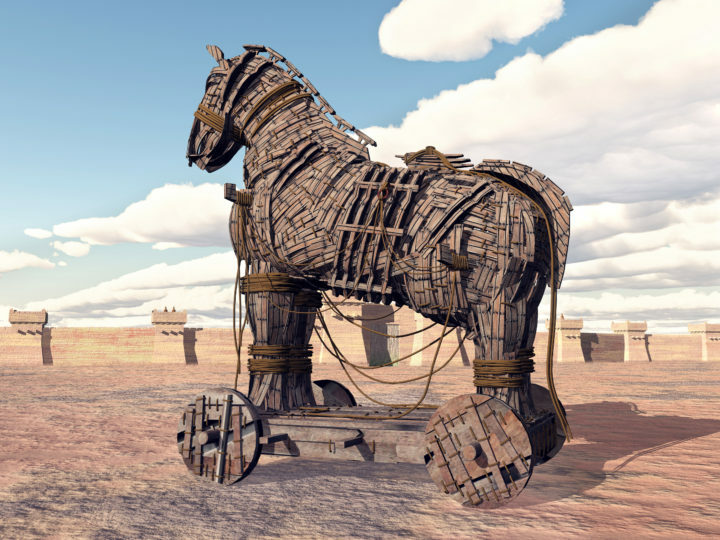 Essentially, the helper play is a trojan horse strategy. Let me walk you through each of the steps. I can’t tell you what to build or how to build it, but I can give you a few principles. First, the helper app needs to be truly helpful. Ideally, it fills a gap in the leader’s portfolio. Second, it cannot be trivial, lest it be simple for the incumbent to build with just a few developers. Last, and perhaps most important, it should be something that can be a secret ingredient or real advantage when you roll out the full product. As we’ll get to in a bit, when you move from friend to foe, the guns will be turned on you. You will still not be big enough to outspend the leader, so you need a technical advantage in your product. Design that from the start. This is pretty straightforward and makes the jobs of your heads of sales and marketing easier. You have a discrete set of accounts to target. Finding reseller partners is easy – just look on the partner listing page on the websites of the incumbent. Your value proposition should be easy to understand for customers who own the incumbent’s product. After all, who knows better than the customers where the gaps are? In the case of Palo Alto, they created what they called a “firewall helper.” At that time, firewalls only understood networking protocols, and nothing about the application data in the packets carried over the network. Yet, there were significant security risks in those application data payloads. So, the Palo Alto Networks firewall helper, the PA-4000, filled that gap and didn’t threaten the core business of Check Point. Importantly, your price point has to make sense. It should be a fraction of the cost of the incumbent’s product. Why? It’s easier for the customer to rationalize. Also, a high price won’t chew up so much of the budget that the customer won’t have adequate funds to renew or expand the deployment of the incumbent’s product. Messing with renewals or expansion is, er, not helpful, and would draw the ire of the incumbent’s sales rep and potentially put you on their CEO’s radar. Once you have enough traction to be taken seriously, then it’s time to partner. Join the technology alliance program of the incumbent and use that exposure to grow. Try to get a speaking slot at their user conference. Write blogs that illustrate how your tech is better together. Get customers who use both to spread the word. Now, you might ask yourself why the incumbent would allow this. Why give exposure to a company doing something that the incumbent could arguably do themselves? There are two reasons. First, as mentioned above, your tech needs to be sophisticated enough that it would be non-trivial for the incumbent to do it themselves. They may want to, and think they have the talent, but when you get big, a lot of your engineering budget is spent on keeping your existing customers happy. So, no time for new projects. Maybe you have a patent or two that will make things even harder for them to copy what you have built. The second reason you will be okay is that the corporate development team – the people who acquire companies – likely have their eye on you. They are waiting and watching to see how you do, and when they might pounce. Assuming you don’t want to be gobbled up by the incumbent – and maybe you do, but if you hold out, you will be worth more – you play the game. By now, your development team should be furiously building out the full product. Sales of the helper product should help you hire more coders. You will also now have insights into the tech of the incumbent, having deployed alongside them for several quarters or years. Also, importantly, you have access to potential customers for your full product. Consider forming a small group of design-partner customers to help you – in secret – design and work the kinks out. The moment of truth has arrived. Time to launch. No real tricks here. It’s all up to your product and execution. You should have pre-sold your full product to a handful of design partner customers. You will need them as references to sell to more customers. Make sure not to surprise your partners. They will be caught in the middle and you want to know who is on your team. How did it turn out? Palo Alto Networks – PANW (IPO in 2012) – is doing just fine. In 2017 revenue was $1.8 billion. They are now an 800-pounder themselves. Their full product was new kind of firewall that not only looked at application data, but subsumed the network firewall functionality, too. They called it the “next-gen firewall.” And Check Point? Still around, but at $1.8 billion in 2017, clearly they have lost that $500 million lead they had in 2004. You can use the helper play to ease into a market and play alongside of the big boys. You may even become one yourself if you execute it properly. We’re running the play at my current company, Exabeam, to take on the big boys in the SIEM market. Will we become a billion-dollar player? Time will tell.